How are you? Hmm? Feeling good about the Pirates this year? Feeling good about the state of the Steelers? Feeling good about the state of the Pittsburgh Post Gazette? Feeling good about the world in general? ME EITHER! I rewrote the “Everything is Awesome” song to “Everything is Awful” and it’s just three minutes of me screamingcrying. But let’s not dwell on that. Let’s talk about other stuff. Let’s talk about how I only recognize the names of about 10% of the celebrities TMZ posts stories about these days. Is this because I’m old? Out of touch? Early onset? I’m going with old because it also explains stray gray eyebrow hairs (band name!) and my ability to finish the Times crossword in under 9 minutes while sucking on an original flavor Werther’s. That’s called a humble brag. All the kids are doing it. And speaking of kids … (please clap for my brilliant segue. I’ll wait.) … it’s Make Room for Kids time! I failed. Then you and I succeeded and we gave the program to the Mario Lemieux Foundation. So here we are. Ten years later. $300,000 later. 350 Xboxes later. Thousands upon thousands of games and movies later. We are on the cusp of our most ambitious year ever. Ready? Install 26 Xbox Ones in the Medical Surgical unit of Children’s Hospital of Pittsburgh. These kids have ALL manner of ailments. Some stay for a few days. Some stay for months on end. They may have had major surgery. They may have respiratory distress. They could be transplant patients. Age ranges are from infant to 26 years old. Many of the patients in this unit are in isolation so they are unable to visit the playrooms. So we want to bring gaming to their rooms. Right now all 26 beds share two rolling carts for gaming. That’s going to change. Install 24 Xbox Ones in the Adolescent Medicine unit. You remember this unit from about eight years ago. Mostly teenagers suffering ailments like asthma, sickle cell anemia, cystic fibrosis, or gastro intestinal disease. They’re the “frequent fliers” who stay for five to ten days at a time, but who come back every few weeks for more treatment. We are replacing the aging Xbox 360s we installed with brand new Xbox Ones. Install 8 Xbox Ones in the pediatric unit of Allegheny General Hospital. This is also an update unit, meaning we are pulling out the aging Xbox 360s we installed and replacing them with all new machines. Install 9 new Xbox Ones in the oncology unit to replace a few broken machines, and to outfit new beds and treatment rooms. These Xboxes are generously donated by Genre’s Kids With Cancer Fund! Could you please, please click here and go to the Amazon Wish List for the sick kids at Children’s Hospital of Pittsburgh, Children’s Home and Lemieux Family Center, and Allegheny General Hospital? We don’t want them playing old Madden. They deserve the latest and greatest games! We want them to have all the new movies too. You’ll notice there’s lots of Lego on there and that’s because Lego is a favorite of the kids. I know this is a huge ask. Over 800 games and movies we need for all 16 units. All items from the wish list will be shipped directly to the Mario Lemieux Foundation where they will be sorted, labeled and boxed for us to deliver on install day in April. I’ll of course share tons of pictures with you of the kids playing their new games! I’m feeling a bit overwhelmed at the size of the list, but I know I can’t fail these kids so I’m hoping you’ll help me as much as you possibly can by buying items off the list, telling your friends to do so, your book club, your soccer team, your church small group. It’s going to take a huge group effort, but I know Pittsburgh has these kids’ backs. Hugs to you all. And get shopping. Please. For sick kids. 1. What is Make Room for Kids? 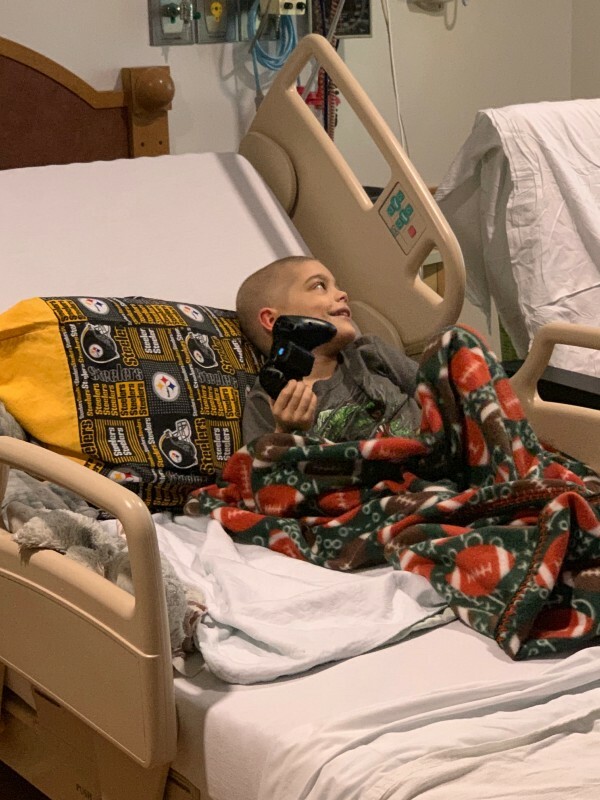 Make Room for Kids began as a social media-driven fundraising effort designed to bring gaming to sick children at Children’s Hospital of Pittsburgh, and is now an official extension of the Austin’s Playroom Project at the Mario Lemieux Foundation. It was named by my butler Mike Woycheck‘s wife Meg, because she is super smart. If I need to tell you who Mario Lemieux is, then I don’t think we can be friends. 2. How did Make Room for Kids begin? You can read the very very early tadpole stages of Make Room for Kids in #2 of this Random n’at post. Children’s Miracle Network partnered with Microsoft to award a $10,000 game room to the three hospitals that earned the most votes in an online contest. I encouraged my readers to vote because I really really really wanted our hospital to win. However, the voting became so slow and tedious due to site issues that I eventually told readers, who were trying to vote their little hearts out, to relax and stop voting. We’d find a way to give the kids a game room without the contest. Short answer, Genre Baker. Long answer, when I first made the decision to reveal my identity, my butler Mike and I began planning a charity reveal via a party at Diesel. The goal was to raise $5,000 for a local charity, but I wasn’t sure which charity I wanted to raise it for. I considered the John Challis Courage for Life Foundation, but I wondered if there was a more direct way I could help sick kids. 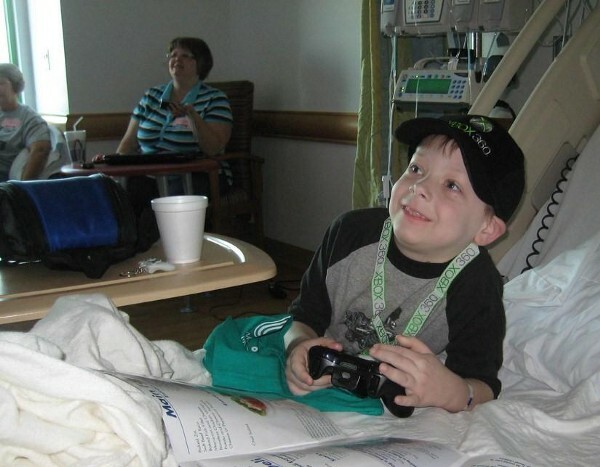 Then the next day at church there was an announcement that a boy named Genre Baker, a church member, was fighting leukemia and in doing so was raising money because he wanted to be able to give the gift of gaming to other patients that didn’t have a hand-held gaming system like he had to pass the hours in the hospital. I ended up nixing the fundraiser idea because it got too big and I got scared because I’m little old me, and I’m a writer. I should use my words to reveal myself. And I did. But combining what I had learned about Genre Baker and gaming, with the contest to bring a gaming room to Children’s Hospital, it felt like I found a way to use what little bit of notoriety I have to do some good for our local sick kids. But short answer, Genre Baker. 4. I like the MR4K logo. 5. Who designed the MR4K logo? There we go. The Make Room for Kids logo was designed by the beautiful and talented Rachel Sager of The Sum of David fame, who also designed my blog’s banner. She’s super kickass [rocker kick]. 6. So, what happened to the room? We then finished up the project by delivering $12,000 worth of laptops, gaming systems, games, iPads and more. 8. So, how about those Microsoft guys? YOU ARE NOT EVEN JOKING. Those guys. Facilitated by Microsoft employee Luke Sossi, the local Microsoft office of 30 employees donated enough money that we were able to outfit every room of the transplant ward and the frequent fliers ward with an XBOX and extra controllers without having to spend a cent of the money raised, allowing us to use that to purchase games, laptops, televisions, DVD players, and lots and lots of iPads. 2012 will bring us the 100th XBOX donated by Microsoft. 9. Why the Mario Lemieux Foundation? Make Room for Kids belongs to the Mario Lemieux Foundation where it has grown and thrived beyond my wildest dreams. 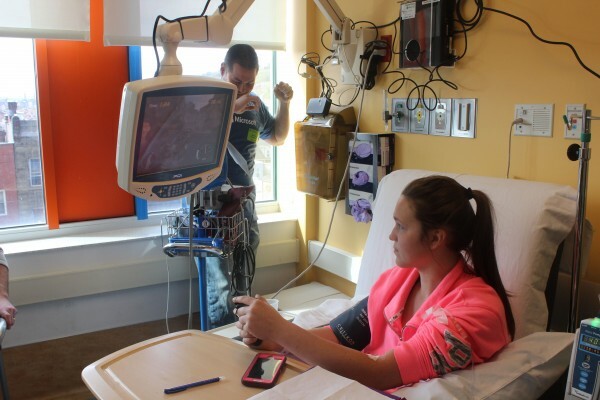 Donations are still vital to ensure the program continues to reach its goals each year to outfit more and more hospital rooms with gaming. We are entering our ninth year of operation, have installed over 250 Xboxes in Children’s Hospital and we’ve got our eye on outfitting every room. We are 75% of the way there. 12. Burghers are awesome people. 13. Aren’t Burghers awesome people?